Vintage Style Teas offer a bespoke vintage afternoon tea service bringing an atmosphere of elegance and nostalgia to your function. Your guests will indulge in the menu you have carefully selected for them which will be served on our beautiful, unique collection of vintage china. 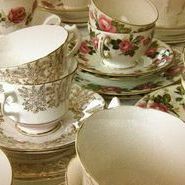 Our prices don't just include the tea service but we also avail you of complimentary use of many items such as bunting, table linen and decorations, and a collection of our vintage games for your guests to enjoy before and after the service. What can I say about these ladies....perfect! Everything was fabulous. They were so lovely and very friendly. The food, service and crockery provided etc were just amazing. They made our first party just what we wanted. We would definitely use them again and would highly recommend them. Thank you ladies. We’re back from our honeymoon and I just wanted to drop you a quick line to say thank you so much. The day was perfect and the decorations and food were amazing. Everyone commented on how kind and help and attentive you all were and loved the sandwiches and cakes. Specially the people with allergies. My friend Neil is gluten-free and hadn’t eaten fish & chips in over 10 years, he was over the moon!! I’m absolutely gutted that I didn’t eat more!